What are the Pre-Call Controls for the AT&T Office@Hand Desktop App? 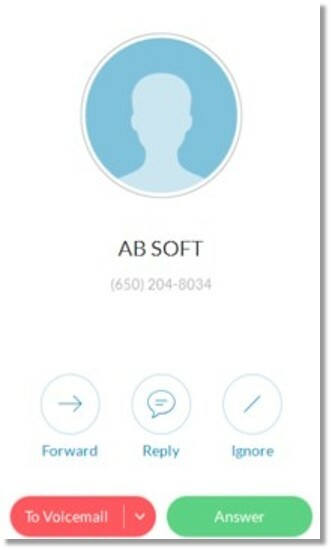 Pre-Call Controls are soft keys that allow you to handle incoming calls in several ways. This article shows the control keys and their functions. Note: Incoming caller’s extension number is displayed when the caller uses the company main number as a caller ID. If your voicemail settings are set up, this will allow the caller to leave a voicemail message. Forwards an incoming call to an extension or another number. Sends a voice response to the caller when this option is selected. The message can be pre-set text-to-speech reply or a custom text-to-speech message. Mutes the ringtone for the incoming call, sends the caller to your voice mailbox.